7 Aug 2018 7 Aug 2018 Evan Spencer1 Comment on Okay, Google: Louisiana Tech! Here at go tech pls don’t die, we aim to serve you–the internet community–with answers to the questions you’ve long been asking: Why am I here? Does any of this matter? What sort of impact can I make in this life? That sort of inane crap is not what I’ll be addressing today. Today, we’re going to take a stab at some of the truly important questions in life: the questions people ask when they google search “Louisiana Tech.” Later, as an added bonus, we’ll look at some Google Trends of Tech-related searches. This should be fun! The internet has some basic questions about Louisiana Tech. Luckily, I’m here to answer them for you! Question 1: What is Louisiana Tech known for? Answer: Louisiana Tech is known for being a Tier 1 research university…okay, okay. I’ll skip the elevator speech and cut to the chase here: Tech is known for its engineering programs, noble trees, Terry Bradshaw, pretty bad TV ads, and soul-crushingly close losses in most sports. We’re also more recently known that play that you’ve seen with Yakkity Sax overdubbed. You know the one (more on that later). Question 2: What is Louisiana Tech’s mascot? Answer: Tech’s mascot is an English Bulldog named Tech! Currently, the live mascot is named Tech XXII. He’s the best boy. Question 3: What is Louisiana Tech University ranking? Answer: On U.S. News and World Report’s 2018 rankings, Louisiana Tech is a Tier 1 University ranked #216 in the nation overall, and #122 among public schools. Important note: U.S. News’s algorithm reportedly does not include any sort of arboreal considerations, and therefore we assume Tech is actually the #1 University in the country, if not the entire world. Question 4: What is Louisiana Tech’s football record? Answer: We’re undefeated, baby! As of right now, Louisiana Tech is tied for 1st place in the NCAA! Okay but seriously, according to Winsipedia.com, Tech’s all time record is 609-458-37, good for 48th place out of 130 current FBS programs. Not too shabby! Question 5: Where is Louisiana Tech located? Answer: Tech is located in Ruston, LA. Home of the Peach Festival, Dawghouse, and Willie Roaf. Ruston has a small-town feel owing to its population (roughly 21,000 in 2010), and depends largely on Tech for most of its economic revenue. Tech is right off of I-20, so next time you’re passing through on your way to somewhere cool like Monroe Shreveport Vicksburg (okay there’s nothing really cool on most of I-20), be sure to stop in! Just don’t try to park on campus. Question 6: Where is Louisiana Tech football? Answer: Why can’t I find you? Why have you gone away? Where is the laughter you used to bring me? Why can’t I hear the BoP play? Question 7: Where is Bayou Teche in Louisiana? Answer: That’s not a Tech related question! Go home google, you’re drunk. Okay fine. Bayou Teche is located approximately 946 Joe Aillet Stadiums from Louisiana Tech. Question 8: Who is Louisiana Tech playing today? Answer: Today, Tuesday August 7th, Louisiana Tech is not playing anyone in any sport. Despite that, we are beating ULL. Not at anything in particular, but at everything. There’s always that. If you are reading this at a later date and would like to know who Tech is playing today, you can check the LATechSports.com schedule! Women’s soccer and volleyball start next week! Question 9: Who is Louisiana Tech football coach? Answer: Alas! To ask such a question of me on this, gtpdd.dog! How can one answer such a ludicrously ignorant question as if the asker did not already know the answer? 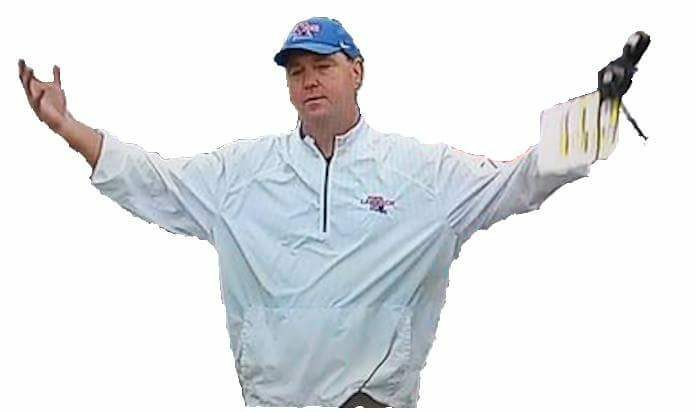 How can I, a mere mortal meme-making monthly manuscriptitian, describe the wonder of Louisiana Tech’s head football coach? They say a picture is worth a thousand words, but can it be true? Let us try to understand the answer through memes; some old, some new: but all devoted to our fearless leader. Google doesn’t just let us see how people ask about Louisiana Tech on the internet. It also allows us to see statistics on when people ask about Louisiana Tech on the internet. So the way this works is that the most popular time on the graph is given a value of 100, and all other values are assigned based on the amount of searches compared to that “peak” time. In the past year, the internet’s interest in Tech peaked with the 51-10 wallop of SMU in the DXL Frisco Bowl. All of the other values are assigned based on how many searches there were when compared to that day. As you can see, people seem to be the most interested in Tech during football season. If you’re reading this, you’re probably a Tech fan, so you know what happened that caused the first spike in interest: the 3rd and 93 fumblerama play vs. Mississippi State. As you can see here, the interest in “3rd and 93” unsurprisingly peaked the weekend that it happened. What I’m interested in is the second map, titled “interest by subregion.” Similarly to the “interest over time” graph, the subregion map assigns a value of 100 to the state in which the search was most popular. Big shocker here, that state was Louisiana. However, I’m kind of confused as to why Mississippi wasn’t ranked second? Maybe because a lot of Mississippi State fans saw the play occur live? Or maybe because cowbells emit the perfect frequency to distort Google’s algorithm? Anyway, Alabamans were more interested in our sorrows than Mississippians were. Also, wtf Iowa? I thought we were cool! Another cool thing Google Trends lets us do is compare the popularity of two search terms over the same time period. So let’s see how “3rd and 93” compares to “Louisiana Tech Football” over the course of last season! This map shows that most of the country searched for Louisiana Tech Football more often than 3rd and 93. However, Washington, Iowa, Michigan, and Massachusetts searched for 3rd and 93 at a higher rate. Here we have the worldwide data, which is fairly uninteresting, because most of the world did not search for either term enough to show up in Google’s analytics. Wait, what’s that? India? Wtf? Apparently the folks in India enjoyed our ultimate downfall. Well, that certainly won’t curry any favor here with us at gtpdd. They are naant going to make any friends here. Chai am telling you, India, you’d better watch your back or us Tech fans will masala your nightmares come true. And with those Indian food/Tech football puns, friends. I’m out. “Soul-crushingly close losses in most sports” really speaks to me. Next We Want J’Mar Part II: Did We Want J’Mar?